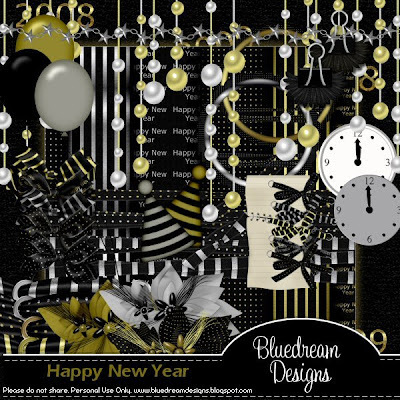 Bluedream Designs: New Year Freebie. If anyone does like it you can download it Here. I would like to wish my blog visitors a very Merry Christmas and a happy and healthy New Year! I don't think I will be making anything new over the Xmas period (Unless am hit by a strong urge lol) as I will be working over Xmas and when am not I will be with my kids. Thank you!! This is just wonderful!! I think the kit is great, I was secretly hoping you would make a NYE kit. So thank you very much! I think you deserve a break over the holidays. Time to rest, relax and enjoy your family! Then after that is over maybe your mojo will return (even though I don't think it has gone too much cause the kit is great!) and you will be creating up a storm! :-) have a wonderful Christmas and New Years! Thank you so much for this Freebie. I want to let you know that I posted a link to your blog in Creative Busy Hands Digital Freebies Search List, under the New Year post on Dec. 21, 2008. Thanks again and Happy Holidays. Thank you very much for this gorgeous kit. Merry Christmas and Happy New Year to you and your's. Merci beaucoup, ton kit est superbe. Joyeux Noel et Bonne Heureuse Année à toi et à toute ta famille. Fabulous! !...Thank you so very much for sharing your talent and your hard work!..I for one am truly grateful and thankful for your kindness and generosity!...Thank you again for sharing and I wish you a very Merry Christmas and a very happy, healthy and prosperous New Year!!! Thank you! Your blog post will be advertised on the DigiFree Digital Scrapbooking Freebie search engine today (look for timestamp: 21 Dec [LA 09:00pm] - 22 Dec [NY 12:00am, UK 05:00am, OZ 04:00pm] ). OH I LOVE IT!!! I downloaded it thank you so much! thank you so much for the lovely scrap i make nametags and extra's and this come in handy for the hollidays. Hello, thank you for share your amazing work! Beauty Kit! Merry Christmas and Perfect 2009! Thanks Bluey! Hope ya have a great Holiday! I love all your freebies. It's a beauty even if you think you're mojo-less!! Thank you for still sharing, I love it :) Merry Christmas!! What a cool kit! I like your stuff. Today was my first visit and I like it. Thank you! Sorry about your mojo...here's hoping it comes back speedy quick! Without mojo, I wonder how you can create such a marvelous kit...I'm thinking you have TO HAVE SOME MOJO LEFT!!! LOL! Thank you! And don't worry, mojo's are like minds: they may wander, but they always come back! you have over a thousand downloads! I think people like it! It is gorgeous! thank you so much!! I think this kit is beautiful! Thank you for sharing! Merry Christmas and a Happy New Year to you and yours!! Thank you for sharing!! It looks wonderful!! Enjoy the season and try to have some relaxation!! Thank you so much for sharing your New Year kit. Awesome!! I happen to love it. Thanks so much!!!! Thanks for the pretty kit. wonderful new year kit and thank you very much! Oh hon - it's gorgeous! And I do thank you for sharing it! Happy New Year to you and yours! Oh hon - it is gorgeous! Thank you for sharing it with us! Happy New Year to you and yours! Great job hun!!! Thanks for sharing!! Great job hun!! Thanks for sharing!! Gorgeous! I don't think your mojo has gone anywhere!!! I love it! You always come up with something great! I appreciate your talents! It's a super kit! You have hight standards if you're not pleased with this. Mojo-less, my tushie! Great work, and thank you for sharing!